The winter of 2013-14 is proving to be one of new endeavors for TV series. There seem to be endless commercials and previews for series premieres and pilot episodes. The past month and coming weeks offer a wide range of shows from comic book adaptations (Gotham) to teenaged supernatural love triangles in Bitten to science fiction Helix. Even an Australian TV series, Rake, has been slotted for an American adaptation. There appears to be at least one new show starting in every genre. Intelligence, The 100, Enlisted and True Detective are but only a few of this winter’s new shows. Even with all of the new shows to choose from, it is still nice to have returning favorites. Psych recently began its eighth season, making it one of USA Network’s longest-running shows. It takes a certain kind of creativity to maintain a series since 2008. Without this, the show would quickly have lost the interest of its audience. Considering the show follows the cases worked by a fake psychic detective with a penchant for rule breaking, Psych has the perfect excuse for doing almost anything with its plot. Over the past seven seasons, the show has explored various genres of filmmaking, including old westerns, Bollywood, soap operas and, most recently, a musical. Throughout the series, Shawn Spencer (James Roday) and his partner Burton Guster (Dulé Hill, Men of Honor) solve crimes that the Santa Barbara Police Department are having trouble with, have deemed unsolvable (such as the Mr. Yin and Mr. Yang murders) or have decided the case is too strange to actually be worth their time. With such leeway to do whatever strikes the writers’ fancies, a show can go one of three ways. The writers could ignore the fact that they are able to do anything, making for a more realistic, but rather boring, show. The writers could go in the complete opposite direction and make the show incomprehensibly strange, but it would include absolutely everything that the scriptwriters might desire. Fortunately for its viewers, Psych’s writers opted for the third path by taking the middle ground. This third choice creates episodes that do make sense but stretch the imagination. Episodes, for the most part, follow a logical chain of events, even when the events themselves are less than logical. However, the writers did not satisfy themselves with creating a comprehensible detective show. They added comedy, probably Psych’s best quality. Most detective shows are serious; the characters are intent on catching a killer and have no time for jokes except perhaps at the end of an episode, after the suspect has been arrested and presumed guilty (few if any detective shows actually have any follow through with the people they arrest). 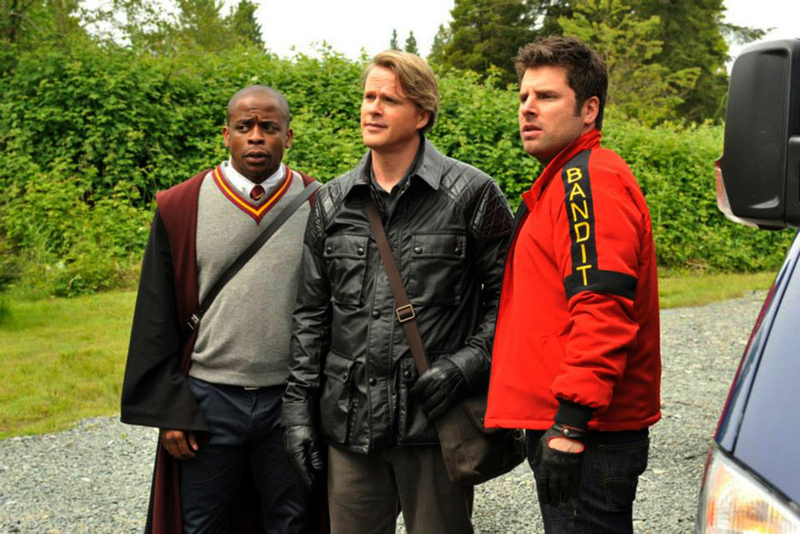 Psych, on the other hand, seems to be dedicated to humor; the characters just happen to solve a mystery while jesting and making endless references to other movies and TV shows along the way. With this concept, the show seems to be destined for greatness. So far, it lives up to its potential. The return of Despereaux (Cary Elwes, The Princess Bride), an eloquent and crafty art thief who was presumed dead, has started the eighth season with a bang, or at least with a few good laughs at the expense of the British. The first episode of this new season is set in England and does not have the usual case to solve. Rather, Shawn and Gus go undercover to prevent a crime from happening while trying to figure out Despereaux’s true identity. As far as the overarching story goes, Psych’s first episode of the year falls flat, but this is somewhat excusable due to the resurrection of Despereaux, arguably one of the most cunning adversaries Shawn and Gus have faced during the series. Hopefully, as the season goes on, the show will not continue to ignore what it presented as major plot points in previous episodes, such as the replacement of the police chief or Shawn’s confession to not being a real psychic. These could lead to some interesting future episodes, but might also make Psych less of a lighthearted comedy as the main characters face life-altering changes.